Audi's hottest A1 revealed | What Car? 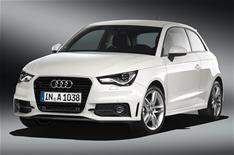 Audi's hottest A1 is available to order now from 20,705. The What Car? Car of the Year now comes with a turbo- and supercharged 182bhp 1.4-litre engine that's capable of taking the A1 from 0-60mph in 6.9 seconds and on to a top speed of 141mph. The power is delivered to the front wheels through a seven-speed semi-automatic gearbox. The extra power is kept under control by and electronic differential that works with Audi's revised stability control system. Audi claims an average economy of 47.9mpg, while CO2 emissions are pegged to just 139g/km. S Line trim comes as standard, and brings 17in alloys, part-leather upholstery, Bluetooth and MP3-player compatibility.